More history captured in a single photo. Download for free this digital photography image to use for digital scrapbooking, mixed media art or any craft project. 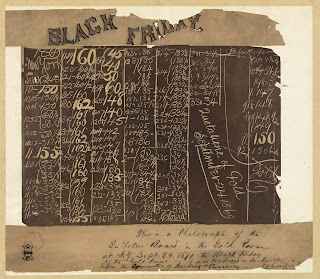 Photograph of the black board in the New York Gold Room, September 24, 1869, showing the collapse of the price of gold. Handwritten caption by James A. Garfield indicates it was used as evidence before the Committee of Banking & Currency during hearings in 1870. Caption and LOC note: "This is a Photograph of the Bulletin Board in the Gold Room at N.Y. Sept. 24, 1870 [i.e. 1869] the Black Friday of the Gold Panic - It was produced in Evidence before the Committee of Banking & Currency.